The last few weeks have been busy, busy, busy! Like I said in the last post, I finished up the boring green blanket -- which I have to admit is very pretty, even if it was boring -- for the WRAP project. You can see more of the afghans and quilts (gorgeous quilts - I especially love Laurie's) there. And in case you are wondering, the book I gave along with mine was Life as We Knew It, recommended by my 13-year-old niece. As I was packing the blanket up, I realized that I had "double-twisted" several cables! That project had to be finished in time to take it to the annual MLA conference in Washington, D.C., which began on May 21. Around the end of April, I decided I should knit my friend Melissa a small shawl for her birthday, which was at the beginning of May, because I knew I would see her at MLA. The color is closer to what's shown in the "blob" photo in my last post. I decide on the small size of Centrique, using Handmaiden Camelspin in Rose Garden. 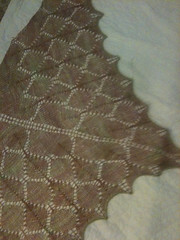 Except, when I finished the small size, I still had lots of yarn left, so I figured I would do another pattern repeat. Of course, I ran out of yarn half way through the last row. 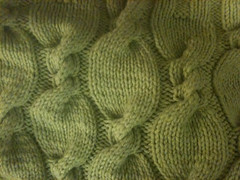 I ended up ripping out the last row and knitting it and the bind-off using Elann Peruvian Baby Silk in Peridot. The green was very similar to the green in the Camelspin. I actually has some Camelspin leftover from Brambler, in a kind of golden brown that would have worked, too, but I really liked the idea of green "tipping." Too bad you can't see it in the pictures! And thus completes my "obligation" knitting. It's not that I don't like knitting for others -- I do, or I wouldn't do it -- but it feels like all I've done since last fall is knit for other people. So, although I have plenty of projects on the needles, I immediately cast on for Anne Hanson's Whispering Pines (in the very same yarn as the one pictured). I've had the pattern and the yarn in my stash for a couple years, but because I knew it was a huge project that was just for me, kept putting it off. 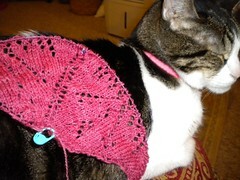 So now, without knitting that must get done by some deadline, I'm working on things for myself (with Vinnie's help!). The other two projects I'm working on for me are the Larkin baby blanket -- which may actually go to a baby, but may stay here with me -- and my Boneyard shawl, which is what I worked on during sessions at the MLA conference. There were lots of knitters at MLA this year -- my non-knitting friends kept telling me about knitters they had spotted. There were so many of us, in fact, that, after the meeting, an MLA group was started on Ravelry! I like the double-twisted cables, too. And cool news about the MLA Ravelry group -- I'll have to check it out! I personally like the way your Whispering Pines matches Vinnie's collar! My verification word is perro--shouldn't it be gato? The blanket is beautiful, love the colors and the cables. And I agree with Chris, I like the double twist. Its a bit of randomness like life. I love how the yarn matches his collar.